The e.l.f. Cosmetics section at my local Target recently got a makeover and they've added lots of new products to their in-store lineup. 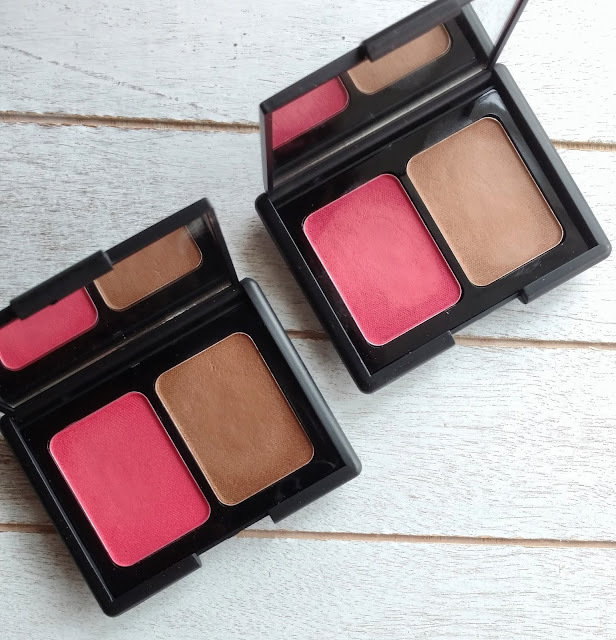 I grabbed a few things, including two of the the Aqua Beauty Aqua-Infused Blush & Bronzer duos ($6). 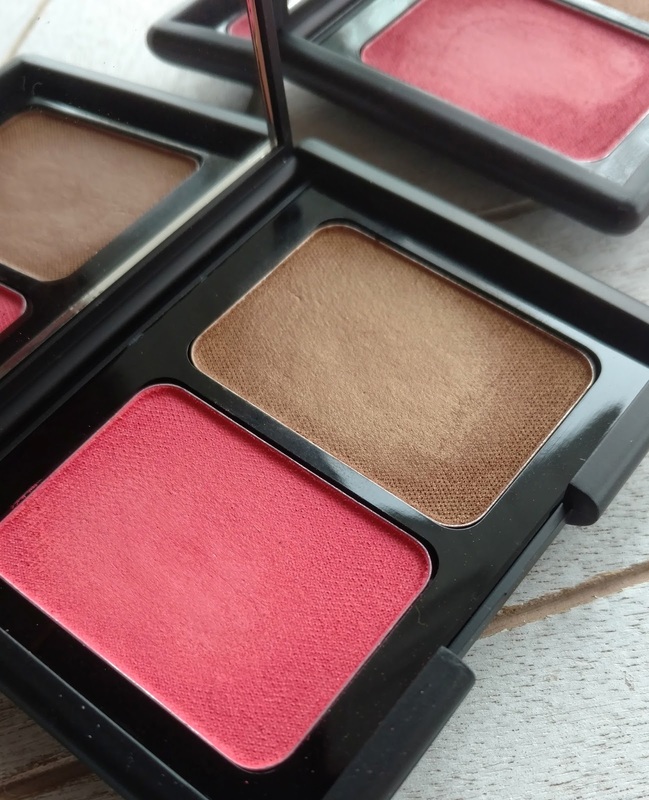 They come in a black compact with a mirror, similar to the original powder blush/bronzer duos they've had for years, except these are a bouncy cream-to-powder formulation similar to Colourpop or the Maybelline Bouncy Blushes. I picked up two shades, Bronzed Peach and Bronzed Pink Beige. Both shades look pretty bold in the pan but go on a lot sheerer with a brush (or your fingers). They all have a satin-matte finish that isn't completely flat but it's not shimmery either. 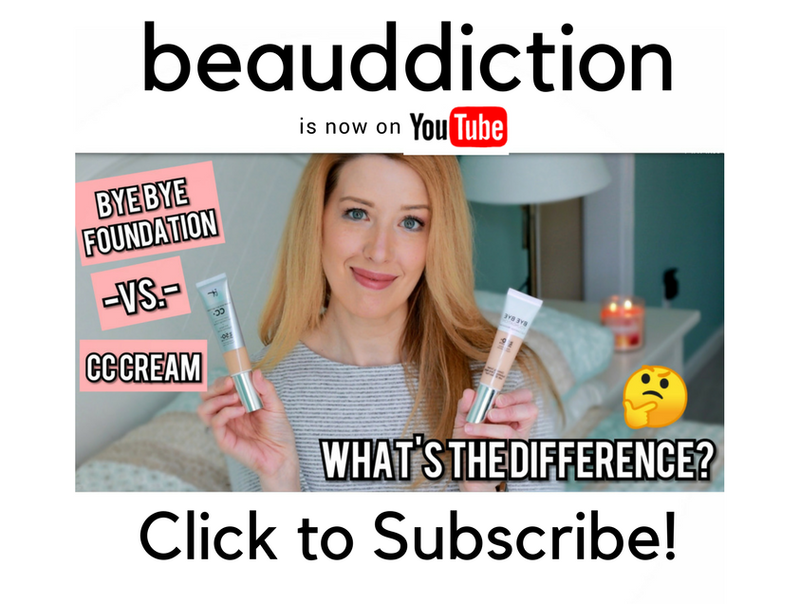 It just gives a very natural, skin-like finish so it looks like the color is actually coming from within your skin vs. lying on top. I've heard a few negative reviews on these that the color goes on streaky but I didn't find that at all! 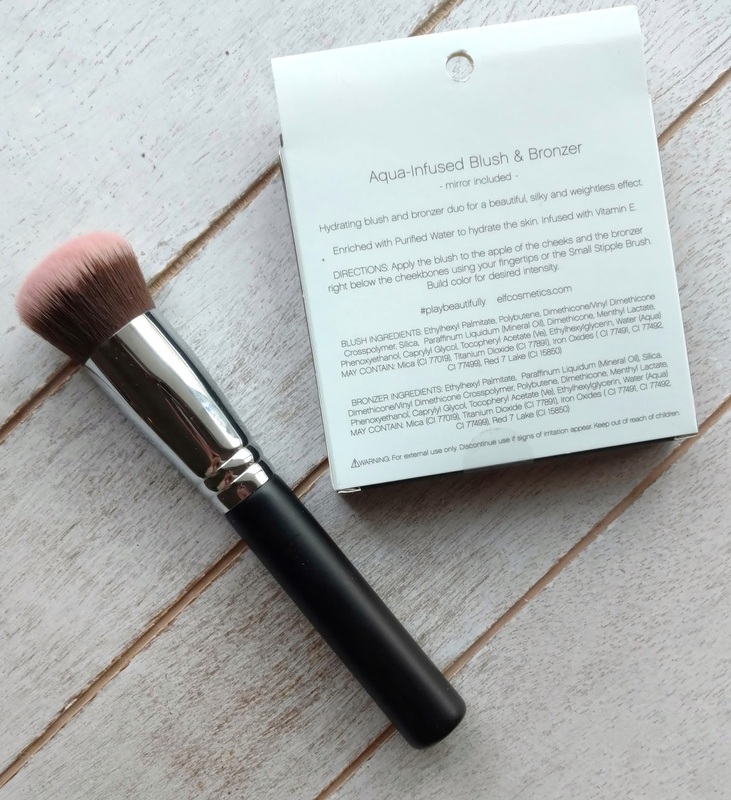 I'm guessing it might go on that way if you used a fluffy brush but I've been applying this with a short-bristled, round kabuki brush and it buffs into my skin beautifully with a super lightweight, smooth finish. If you're wondering about the brush in the photo below, it's by Beauty Junkees and they are the best brushes ever! You can get this brush as well as the rest of their line on Amazon here...they're very affordable and outstanding quality (definitely check out the Amazon reviews!). I reach for them more than any of my other brushes. I have this set (which includes the round kabuki brush) and this eyeshadow set. 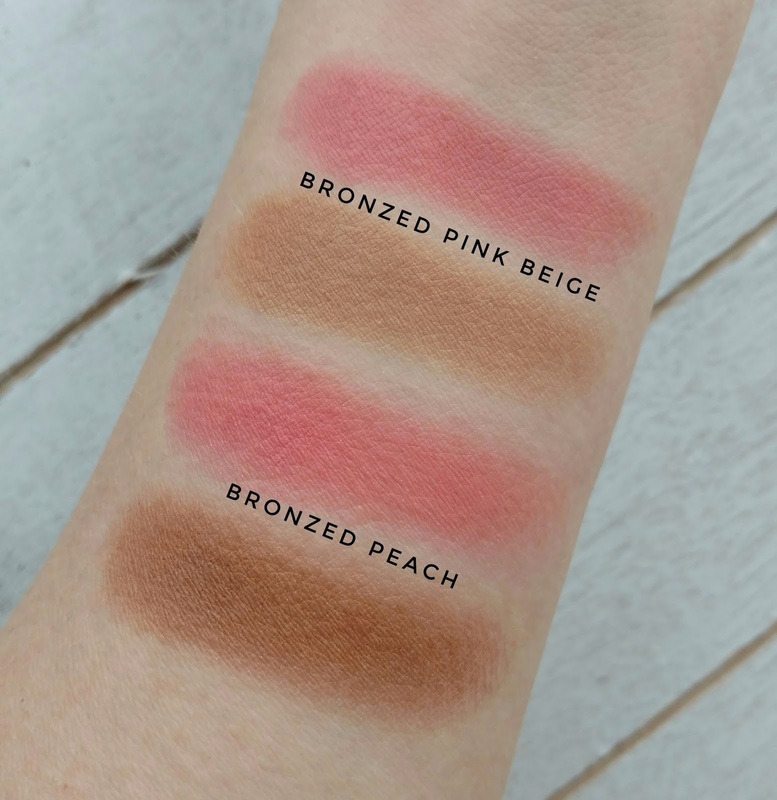 The shades in these palettes are beautiful and both the pink and peach blushes work with my fair skin tone. The finger swatches make the color look a bit deeper than it actually is when you apply it with a brush...they go on a bit more sheer than they look here. But they're also buildable so if you have a deeper skin tone, you can probably build them up more. The bronzer in the Bronzed Pink Beige duo is perfect for my skin tone and it looks SO natural on my skin...especially since I'm so dry. The cream is so lightweight and feels hydrating, so it looks luminous rather than making my skin look muddy or dirty. I was also very impressed with how long these lasted on my skin...8 hours later I could still see the color on my cheeks. Overall, these are definitely worth picking up the next time you're at Target! They're especially lovely if you have normal to dry skin because they look so natural and feel like you're wearing nothing on your skin. Disclosure: This post contains affiliate links. Products featured were purchased by me at Target. 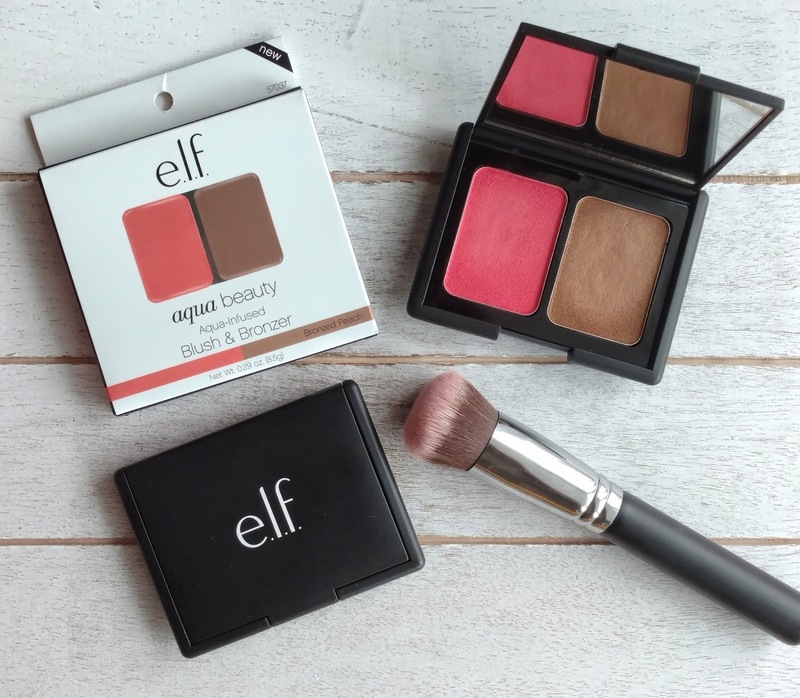 I have the same two colors of the ELF Aqua Blush/Bronzer, and I really like them. I find them really easy and forgiving to use. They do look bright in the pan, but they go on very sheer and you can build up the color. I like to use my fingers to apply them - it looks the most natural for me that way. The colors are really pretty and glowy on the skin. If you have used the Covergirl TruBlend Contour Palette (I have that one in "medium"; I only use the bronzer shade) - it is very similar. I also picked up bronze pink beige and I love it! It applies so quick and easy (I use my fingers), and I never thought it was patchy. I've been using it all the time now. Great find from elf!